This is one of the main cultivar in my grove in 2011 my 7 year old trees produced close to 100 lbs per tree. It is a peculiar fruit. 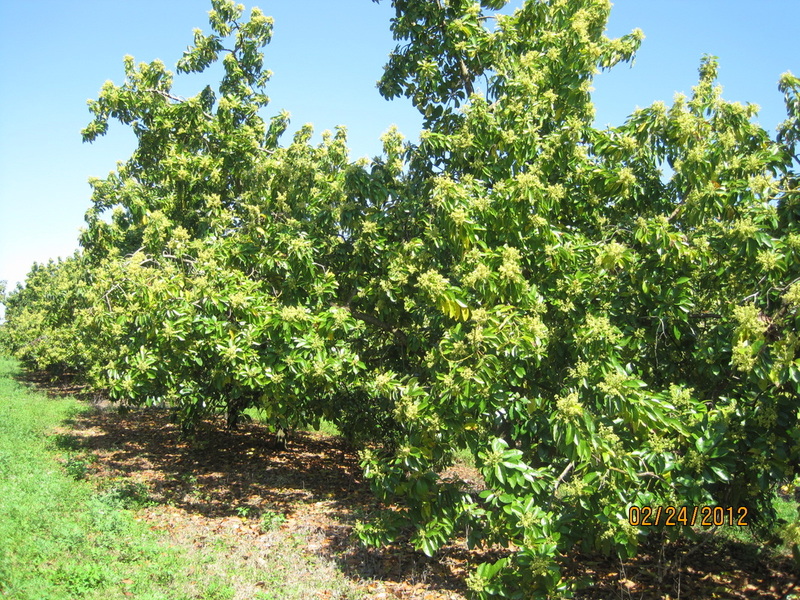 Once the fruit sets and temperatures begins to warm up and rain or irrigation is regular they grow very fast and it is the earliest commercial variety to go to market in Florida. On 2011 I had Donie fruit the first week of June. Average fruit size is 16-28 oz. If you leave then on the tree the fruit keeps getting bigger, they start dropping off in August. I have seen this variety also spelled "Doni" "Donie". Harvest 2012: My 8 year old trees produced an average of 110 lbs per tree. December 26, 2012. The trees seem to be building the coli-flowers to get ready to flower very soon. In the top of the trees you can see a few opening flowers. The trees look clean, green and so far no white fly or sign of sooty mold like I had last year. January 19, 2013: The trees are blooming and there are a lot of open flowers. March 20, 2013: Looks like it will be a good year, fruit is setting very well. As good as I ever seen it. Flowers may have another 10-14 days to go. April 14, 2013: The Donnies are off and running. Probably due to a mild and strange winter they set and are holding a good amount of fruit. Lets see it its true. I predict 140-150 lbs per tree on the average this year, We'll know by the end of July. June 22, 2013: Seems like my Donnies are headed for a record year. I do notice this year their flavor is better than prior years. So far I picked picked 110 lbs on the average per tree, may be I will not reach my prediction above. August 1, 2013: I came in a bit off at 133 lbs per tree. A 20% increase over last year. February 2, 2014: Some trees have open flowers, not a lot, seems to be behind last year. February 27, 2014: Donnies are two to three days away to full bloom. Beta's are ahead of Donnies. This is the first time I see this. August 30, 2014: The Donnie season is over my trees produced and average of 200 lbs per tree. A very good and predictable early producer. April 13, 2015: I have neglected to report on this variety. This year the late February cold snap, (I registered temperatures of 31 degrees in parts of my grove) cause all the fruit set to fall off along with flowers. The trees then set a second bloom that is just about finished. So this year there will be an light normal crop, with a not so large second crop. I have some fruit from the first set in the 3-4 oz range and some fruit the size of nickels and dimes. No ideal how is going to play out in production.